Many bloggers right now are beckoning an early Fall with posts of warmer clothes with muted color palettes. 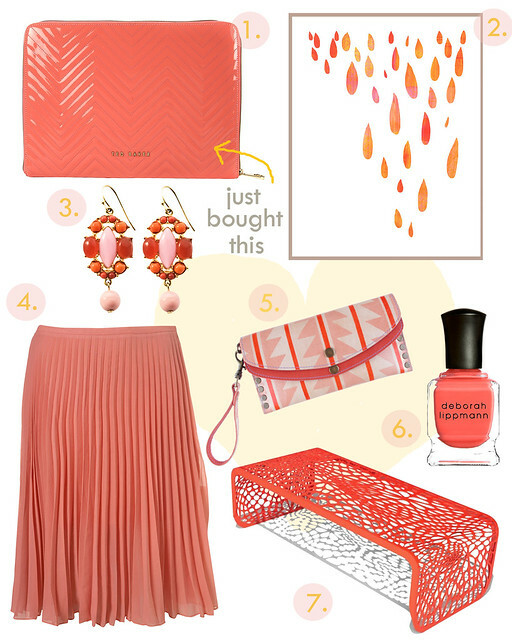 I still consider today Summer so I'm going to post about one of my favorite summer colors - Coral. Here are some of my favorite picks in this hot shade. The Ted Baker quilted laptop case is what inspired this whole post. I spend a good part of a three days searching for the perfect laptop case. After finding the "Lianna" case in coral, I knew I had hit the jackpot. I luckily found an online UK distributor and it will be mine in 15-20 days!